I have always recommended the Brooks Adrenaline for a narrow foot, but am pleased to announce that Brooks Addiction is also an option for a narrow foot. 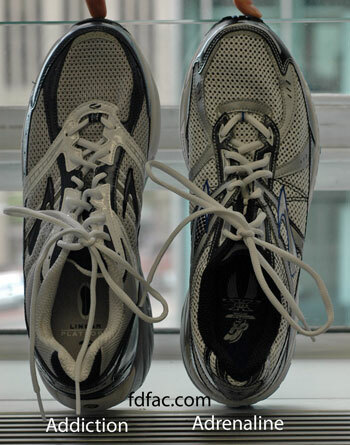 In fact, if you have a flat, narrow foot, Brooks Addiction is probably your best option. 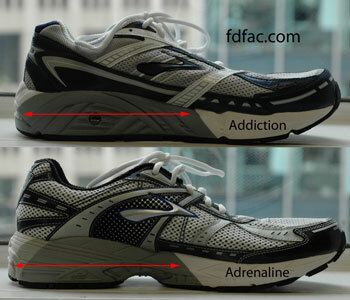 Similar to the Adrenaline, the Addiction has lots of medial EVA which is great for heavy pronators. It also doesn’t hourglass in at the waist which is good for flat feet. 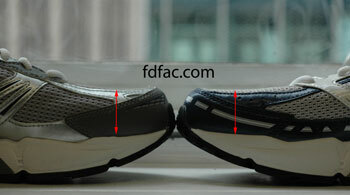 Both models come in narrow widths – A width for women, B width for men. Overall, I am very pleased with the new Adrenaline as it fills a much needed void for the narrow foot category and at only 3 ounces heavier than the Adrenaline, the Addiction 9 is sure to please. I was shocked last week when the July 26, 2010 Issue of Sports Illustrated arrived in my office. 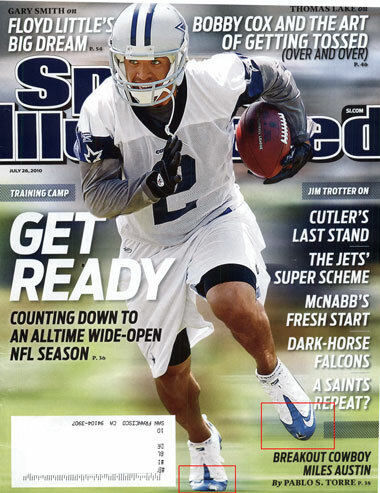 There on the cover is Dallas Cowboy wide receiver Miles Austin III, running down the field with holes in his Nike sponsored cleats where his big toes should be. Yikes…one of the faster ways to derail athletic talent is to wear shoes that don’t fit properly which is happening here. 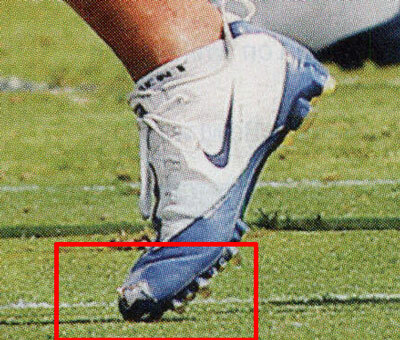 Without seeing how the cleats fit when he is standing still it is difficult to determine whether there is too much volume and he’s sliding forward or whether the toe box is simply too short. One thing however is certain, having your toes exposed and unprotected is not a good thing, especially in a field sport. I think Mr. Austin’s trainers should give me a call. 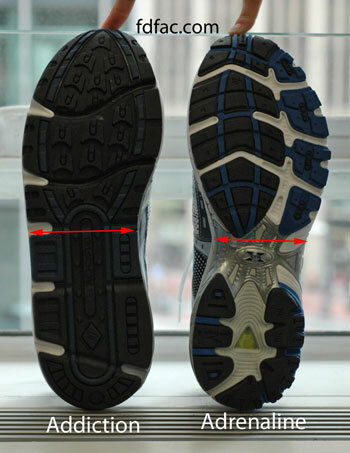 I have blogged about Brooks Addiction 8 in previous posts https://drshoe.wordpress.com/2008/10/10/shoe-review-brooks-addiction-7-vs-8/ and have been waiting for the 9 to debut. Fortunately, the version changes have been worth the wait. 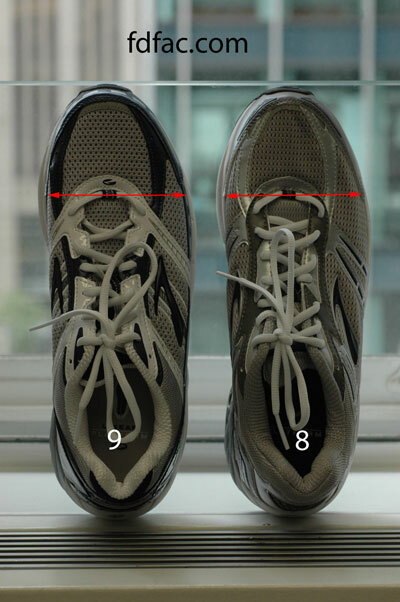 I much prefer the Addiction 9 to the 8 because it provides better midfoot fit. It also narrower which matches most feet better. The toexbox depth of the Addiction 9 is shallower, so it won’t feel like you’re toes are swimming, which for some runners happened with the 8. Other than these changes, the Addiction 9 is the same stable well designed work horse that the Addiction 8 was. Keep up the good work Brooks.